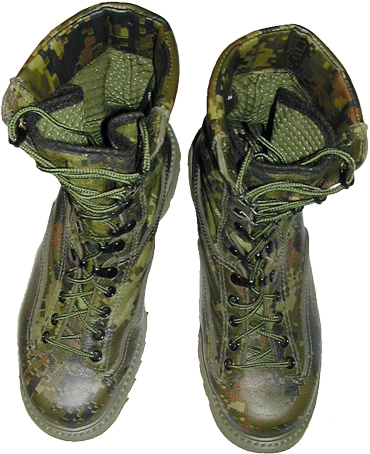 The Canadian CADPAT uniform pants feature inner pant legs (so-called "sand trap"), which are to be tucked inside the boot, once it is in one should lace up the boots and tie them off. The next step is to place the outer pant legs over the top of the boots and to fix them with Velcro closures and elastic cord & lock for pant hems, so it should look neat and smart, not wrinkled or uneven. 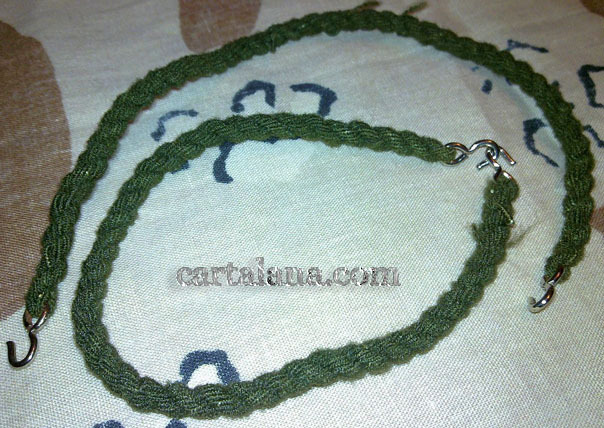 In the previous years it were green-colored twist elastic boots bands with metal hook closure, which were used for the same purpose. The ability of these bands to just disappear caused many jokes and the necessity to have several spare samples in the pocket. The bottom of the pant legs (the cuffs) used to be tucked under the boot bands, not inside the boots. 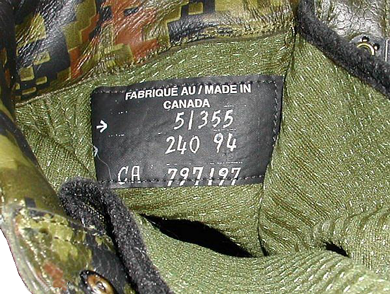 The inner layer of the boots is Cambrelle®-lining, and bear the labels with such information as size and widths, country of manufacture (Canada) in English and French, and the military ID numbers. The pebbled leather is treated with silicone on the factory, so it is not recommended to apply to them any shoe polish containing natural bee-wax or silicone. 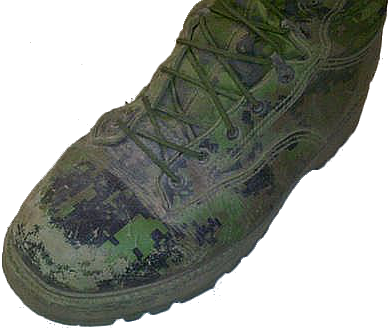 Only special silicone-based shoe-cream, provided with these boots, is to be applied to preserve the colors and features of these footwear. 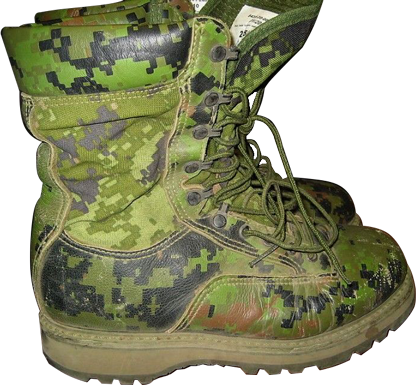 Actually such special cream is often not available to the soldiers wearing CADPAT boots, so the camouflage paint on the boots tends to tear and wear out just for couple weeks of field use, especially in the toe area. 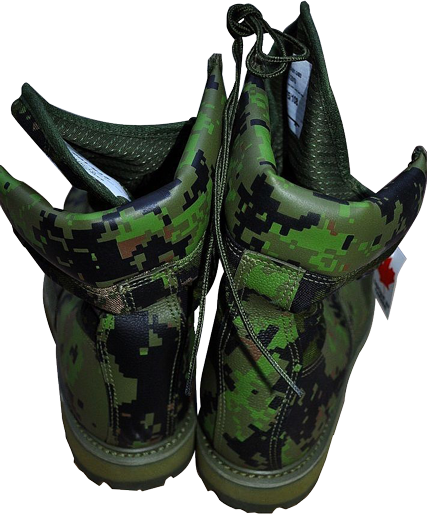 Due to the pixellized nature of the CADPAT camouflage, it is really impossible to recover fully the original colors of the pixels, as distinct from all-black leather boots, which can be easily refreshed with shoe polish very quickly and anywhere. So the scratched CADPAT boots look much less impressive. This simple truth came out after 6 years of field tests (2004-2010)! In other words, one would need some multi-color boot polish equivalent to get them back in shape. With so many colors going on, there is no way to use polish to restore the leather of the boots that boots usually get scraped up in the field. That is unless there was a polish by the numbers kit. However, many new ideas and concepts did face with resistance and misunderstanding in the past, but anyway managed to prove their usefulness. 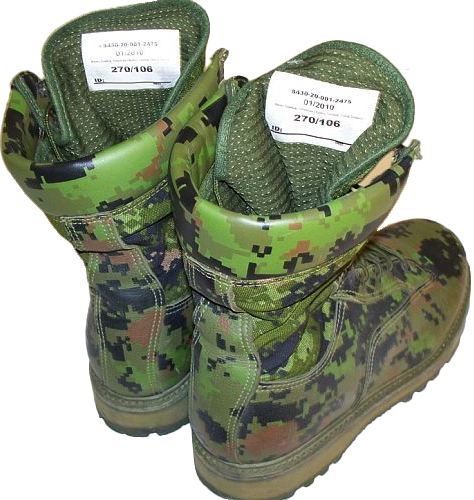 There were also full-leather CADPAT variants of the CF boots, manufactured by "Terra" company, both in temperate-Woodland (TW) and Arid (AR) camouflage. 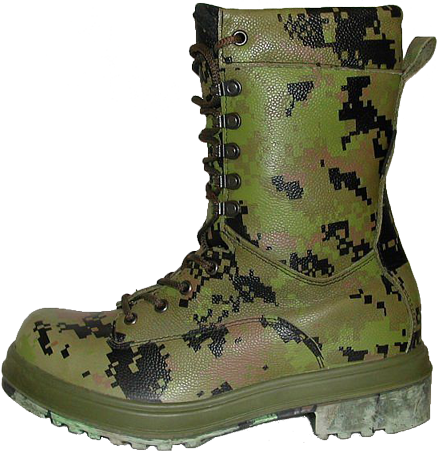 The out-sole tread pattern looks very similar to the one of conventional Canadian boots, the so-called "Black Pebbled Leather Combat Boots" (Mark I - Mark IV). This tread pattern was "borrowed" by the Canadians from the British military "High-Leg Combat Boots". 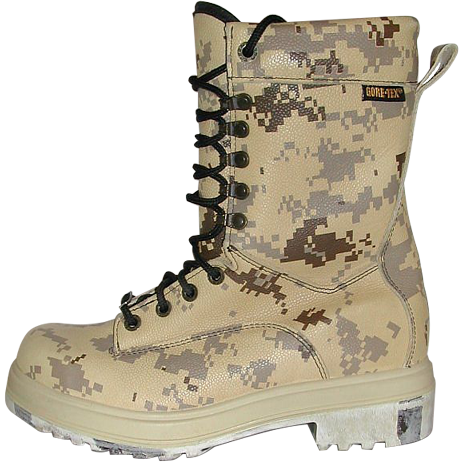 The care of these boots consists of brushing all dirt and debris off after each use, because layers of caked-on dirt and mud will make any footwear wear out faster. Nylon and mesh uppers can be washed with mild dish soap and warm water, because using harsh detergents can break down synthetic fabrics over time. If these boots got soaked, the best one can do is to fill the boots loosely with newspaper or paper towels and let them dry in a warm place, far from any sources of open heat or sun, because this can damage or weaken the boots. The leather parts of the boots can be cleaned with a gentle leather cleaner, dried completely and then rubbed with special silicone-based leather conditioner to prevent the leather from drying out. The treated leather will naturally repel water and dirt. Periodically cleaning and re-treating the boots can significantly extend the life of footwear.